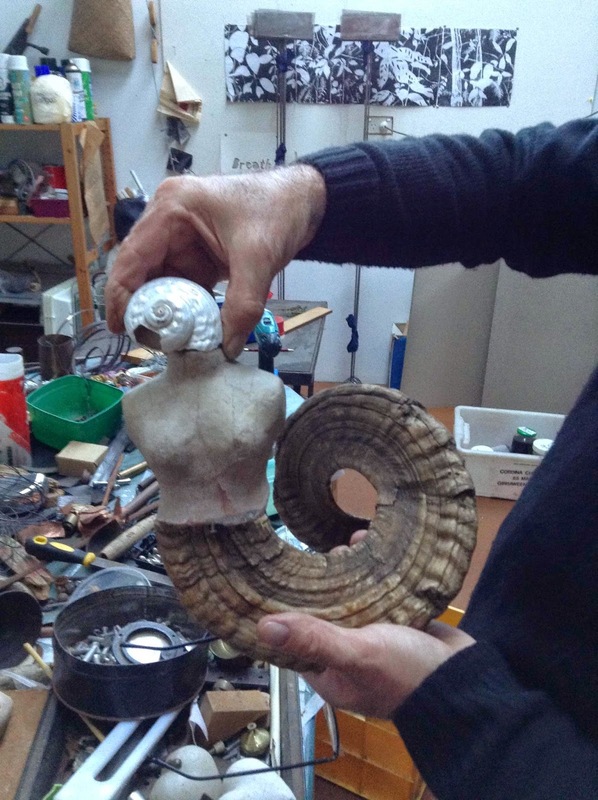 Last week I spent the most enjoyable 8 days, counting travelling time, with a group of like-minded people who really love to turn so-called junk into interesting sculptures. 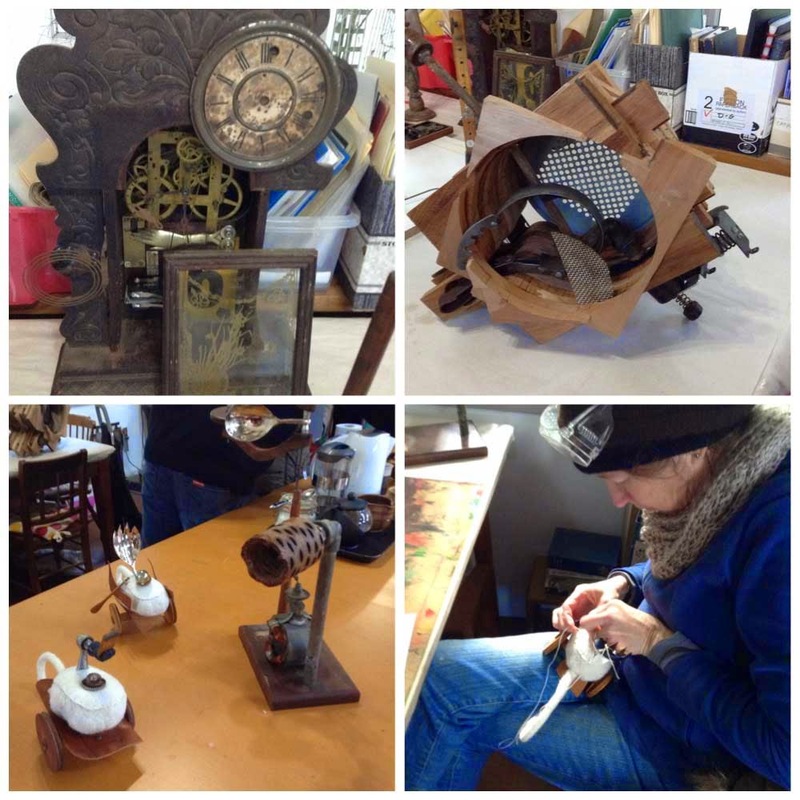 Anita Larkin, our tutor, is an acclaimed found object assemblage sculptor and it was a privilege to be in her class. I had no idea what to expect and my usual shyness had me considering whether to abandon the whole idea and stay at home. 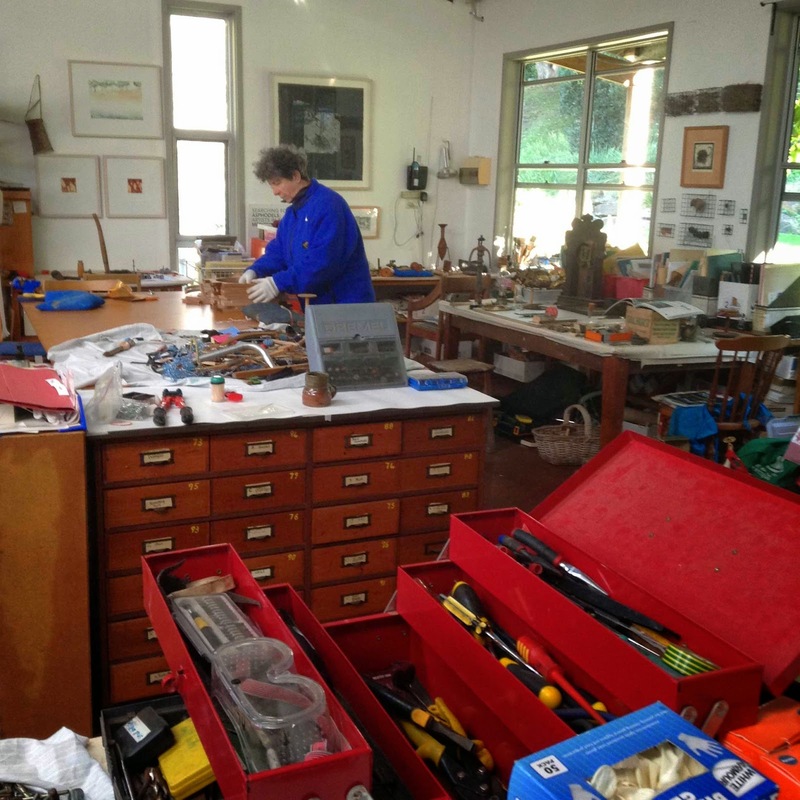 The workshop was to be held in Liz Jeneid's studio and I had opted to stay in Liz's home for the duration. 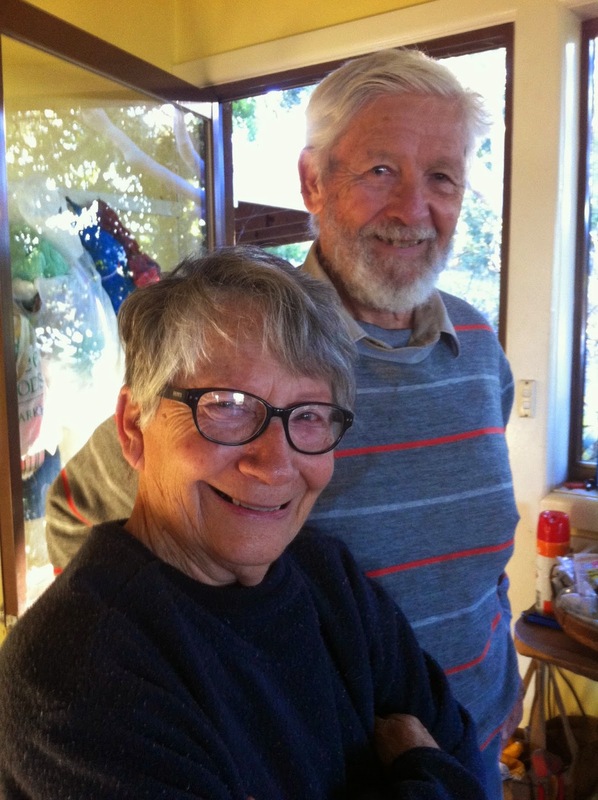 Fortunately, email conversations with Liz calmed my fears and within five minutes of arriving at Mount Kembla I was wrapped in the warmth and hospitality of both Liz and her partner Graham Bartholomew. 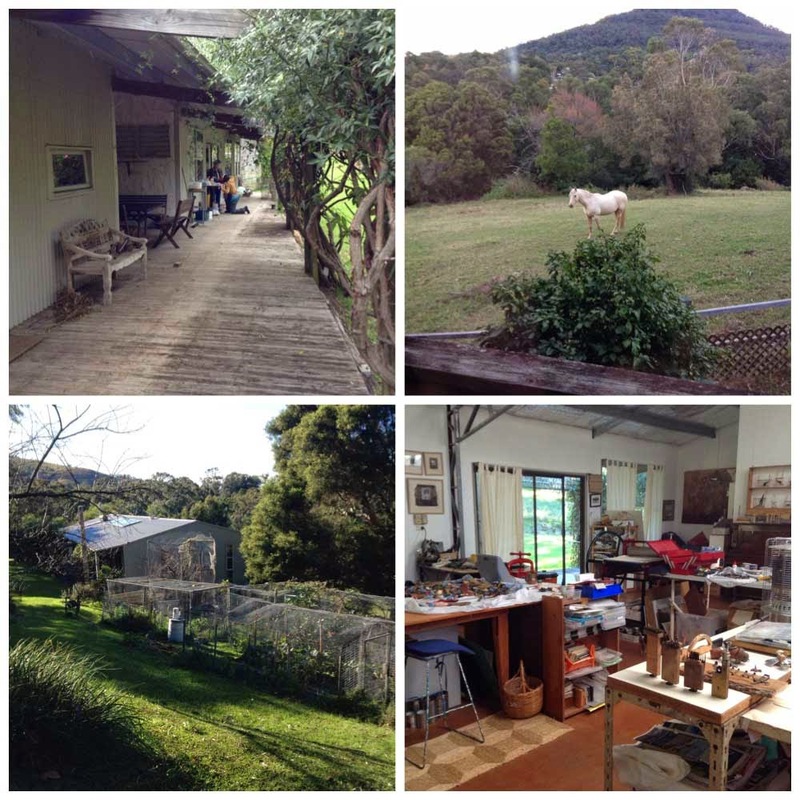 The house and studio is set on a beautiful parcel of land, hilly, grassed and treed, with horses wandering around adding to the agricultural feel, but once you reach the studio you are immediately immersed in the peaceful atmosphere that I think is Liz's hallmark. For three days we worked with Anita whose initial approach was an eyeopener to most of us. 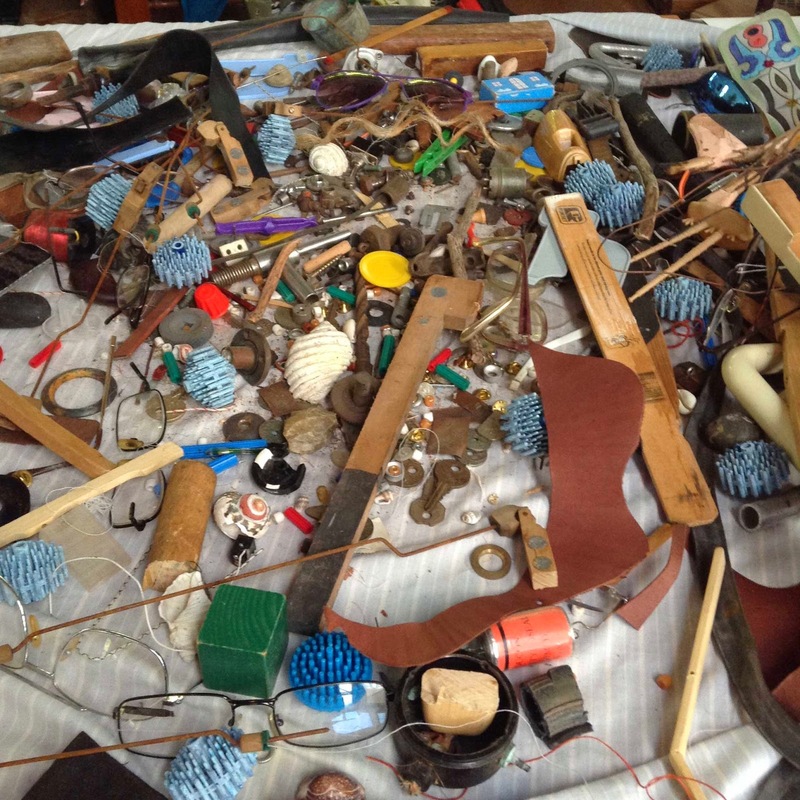 Anita emptied out a huge heap of "stuff" onto the central table and told us to play. 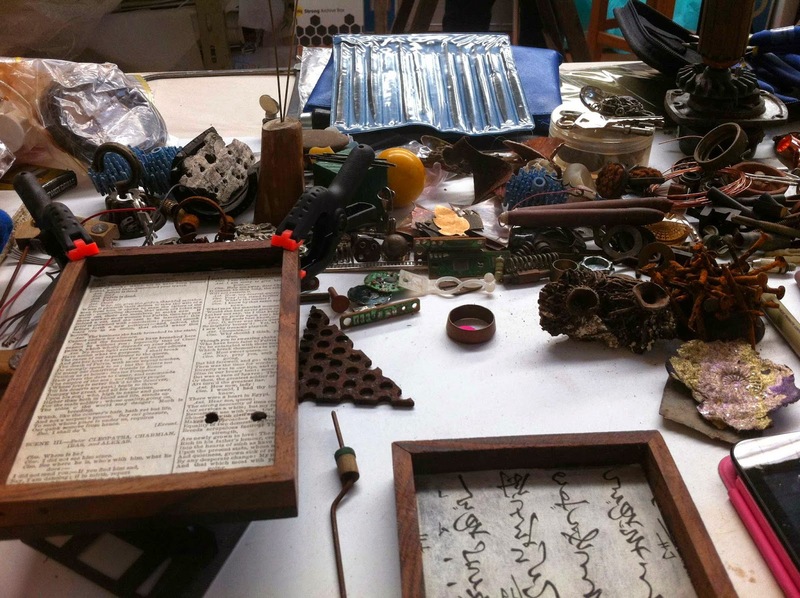 We'd each brought a load of potential treasures with us, and these we'd set out on our work spaces, but here we were being offered even more options, and with the instruction to let our hair down and not to be too precious about it. After three days of making, we had a day off. Most of us went searching the South Coast for tip shops, junk shops, anywhere we could find trash and treasure. What a satisfying day! 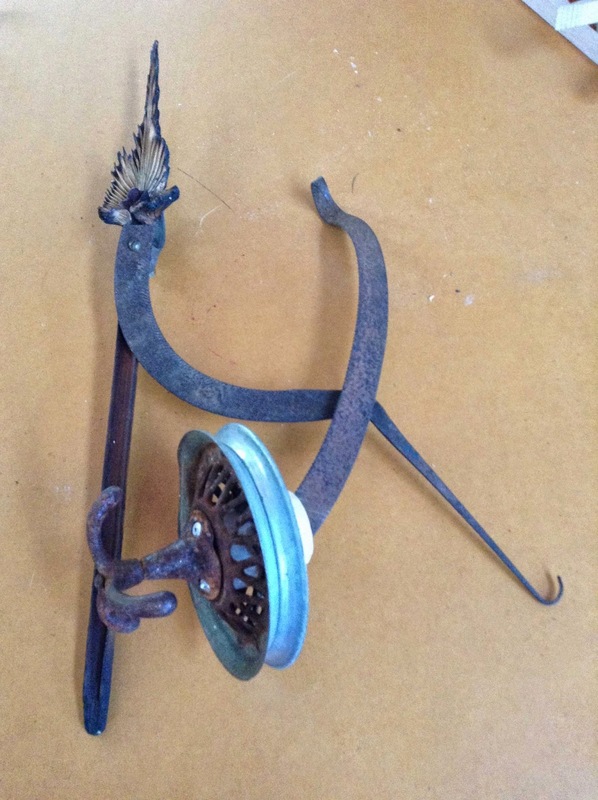 I went adventuring with Liz Hutchinson and we filled her car with old tools, bits of metal and timber, jars of nuts and bolts... LizH generously offered to drive me home at the end of the workshop, which meant I could collect more than if I'd been going home by train. We ended the day with a visit to the Wollongong Art Gallery to see an exhibition of found object sculptures, including one by Anita Larkin. I will put photos of the exhibition in my next blog post. We were treated to a demonstration of this amazing 3 metre, felted musical instrument made by Anita. 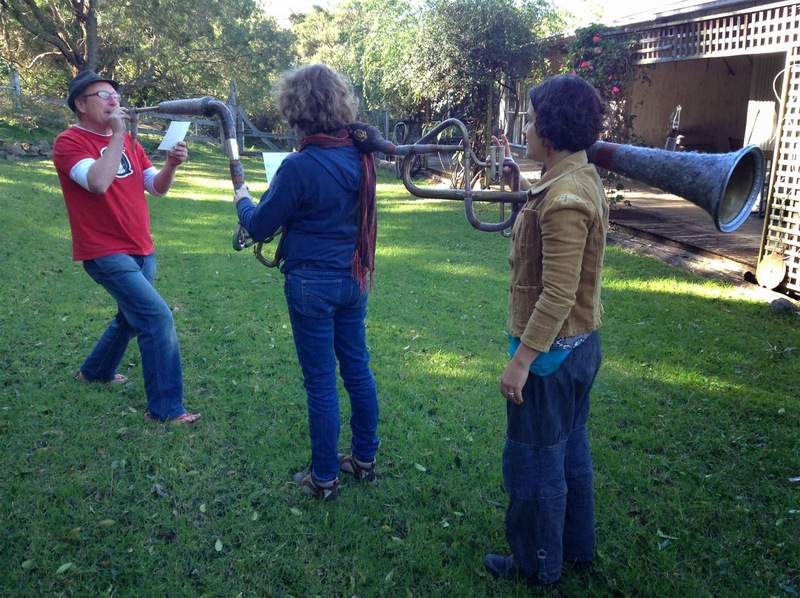 Three musicians are required to play it, here Anita and Rachael are pressing the notes and Mark Holder-Keeping, the composer, is actually providing the wind. The notes were clear, musical and pleasant. 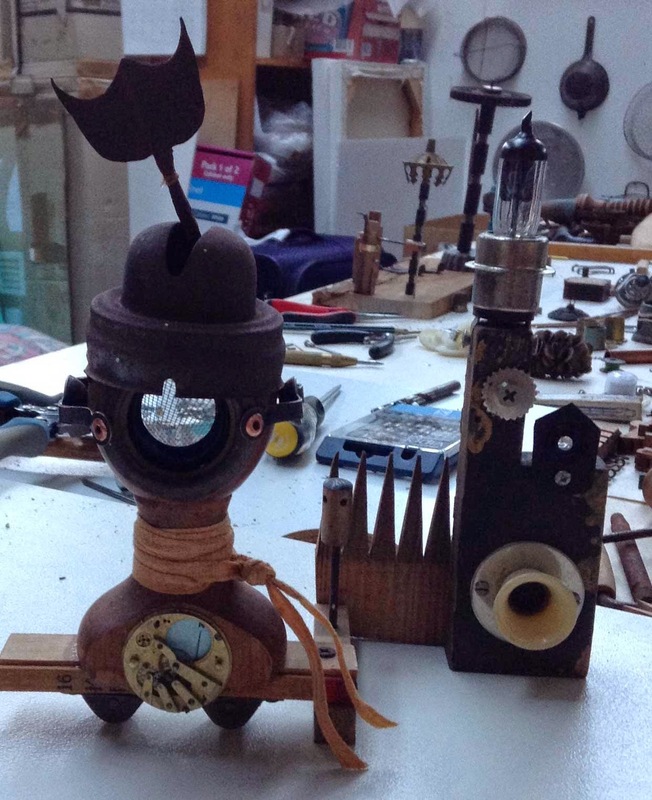 A short film was made on the day and will be exhibited with the instrument as it goes on tour. From top left, clockwise: Estelle Virgen, PaulK, LizH & Anita. 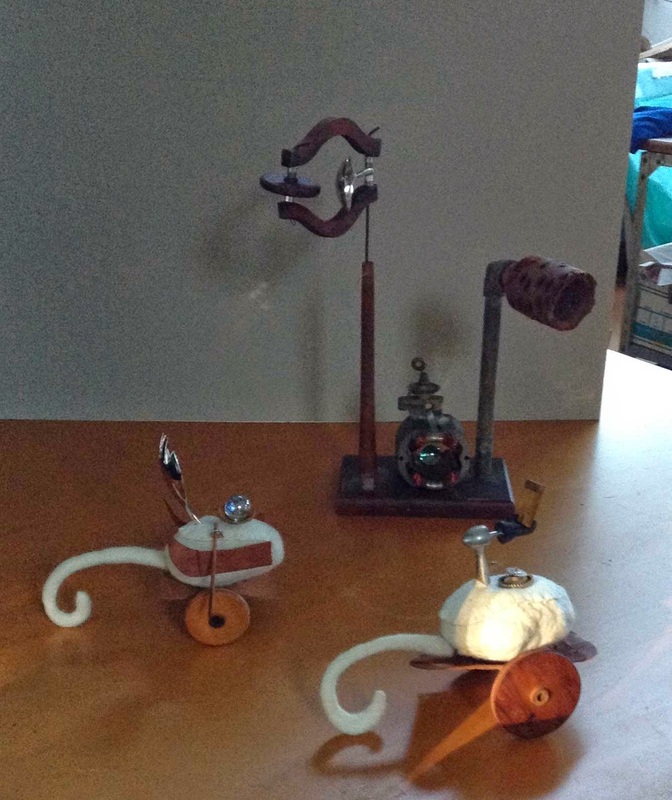 Difficult to take photos because of the plethora of materials in the background but here above are some examples of the very clever items produced by Estelle Virgen. Cherry Corr's organic/mechanical object was meticulously built and it was fascinating to watch it come to life under her hands. I apologise that the photo can't do it justice. 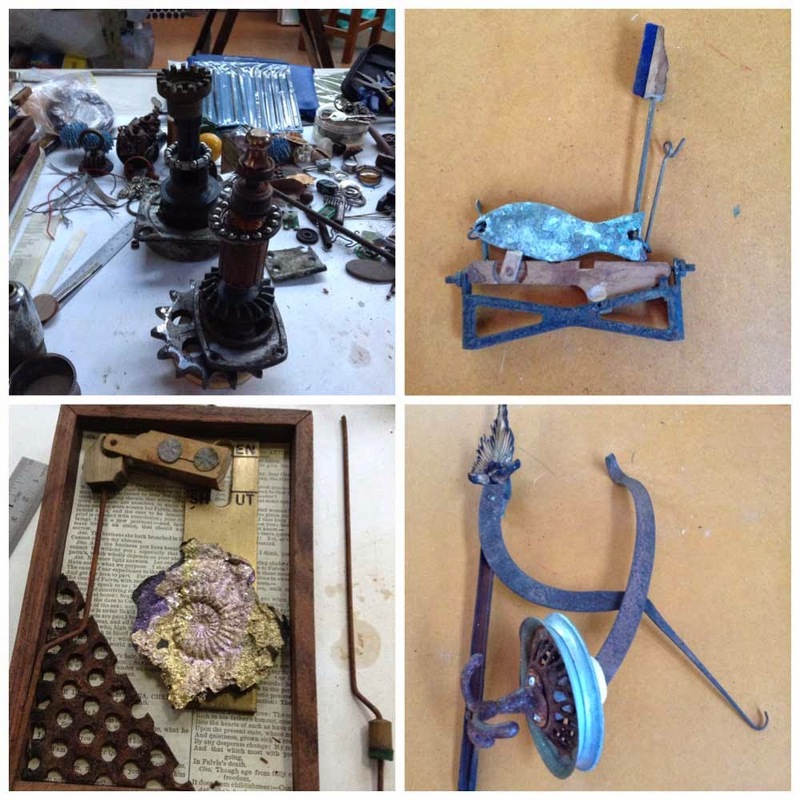 The top photos above are of Liz Hutchinson's reworked clock and sculpture of timber and metal. The lower photos are of Rachael Cheeseman working and her pods. 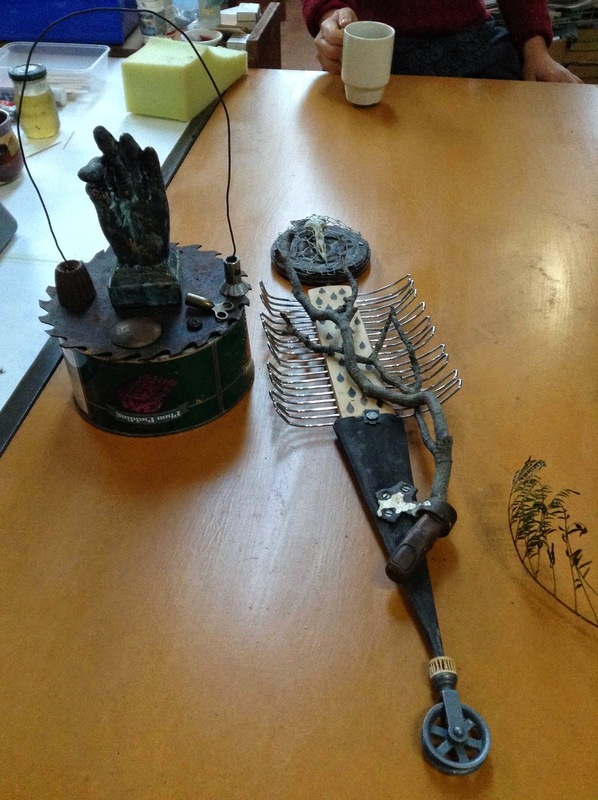 Rachael began with a story in mind and made her sculpture to tell the story. Jan Kierzkowski worked on these figures above. Jan has a charming blog, do have a look. Paul Kierzkowski with his mermaid. Jan and Paul had a magical stash and I couldn't help feeling a tiny pang of envy. 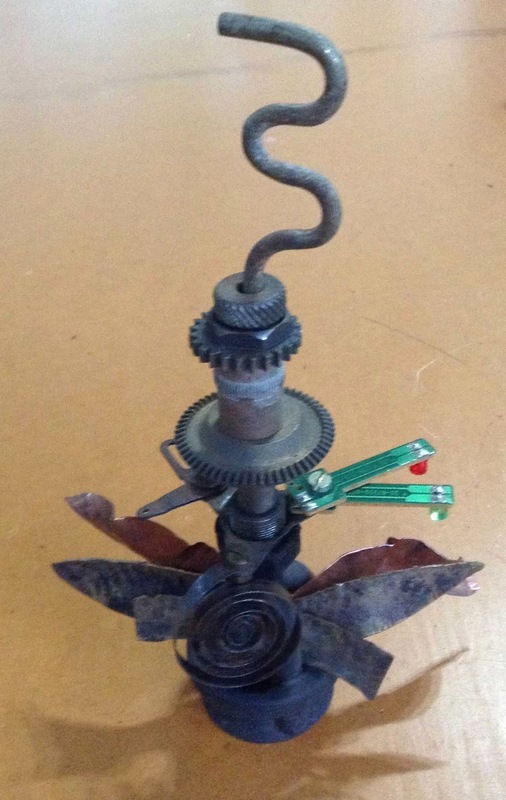 My own sculptures were quite varied. As well as my sickle pieces, I made a couple of box pieces, two possible brooches (see the fishy one) and several totem poles. Packing up, and packing the car were quite hilarious feats but we did it. Saying goodbye was filled with affection, gratitude and tinged with regret. Liz and Graham were the perfect hosts, Graham was incredibly generous to two shed hunters, Anita is an inspired teacher and our group of students were filled with enthusiasm for the found object. Thank you so much, Liz H, for taking me to my door - we had a great time together. Wow. How challenging, exciting, and fun! Love (and am awed by) the creativity. Thank you. 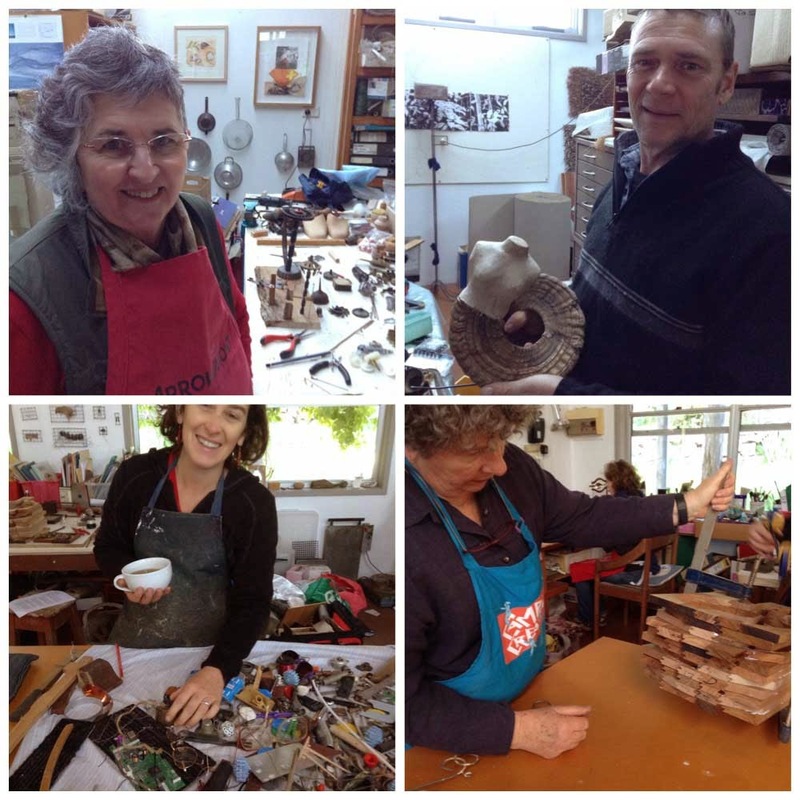 Sounds like a wonderful workshop! I can relate to a shyness of actually going. Sounds like it was very much worth going nevertheless. I am looking forward to seeing the sickle again, and thanks for the many photos. - So many different things were being made. As I said, it sounds like a wonderful workshop. I need to state right away that your unfinished sickle sculpture is fantastic! It's the one I like the most and I wonder if it isn't really finished in its unfinishedness. (Sorry, you create beautiful sculptures, I create awkward words :-) ) It must have been a mind-changing experience for you! Hi Ersi, thank you for your kind words about my sickle sculpture. Perhaps it is complete - I'll have to live with it for a while. And you never create awkward words, your posts are full of beauty. Carol, I came in from your IG site. You must post your artwork, it's wonderful! Hi Katie, welcome in from the IG site. I must get my stuff in order so I can take some decent photos for IG, at the moment I just seem to have big piles on every surface. Thanks for your generous words. Oh everyone had such a good time, thanks for sharing, Anita has such a wonderful sense of whimsy. Hi Mo, I thought you'd know Anita. I think she shows at Defiance Gallery. Anita has such a sense of playfulness in her work but at the same time is meticulous in her methods. A great teacher. Hi B - you're so right, letting go is essential and I'm going to try to do that. I'm constantly inspired by the way you transform materials - you certainly give them the opportunity to shine.